Admit it. We live in a hectic world. Stress and pressure are waiting on every turns and every corners. So how can we dodge the bullet? Well, have some tips below. In 2008, at the tail end of a business trip that took her from Kenya to India to Romania, Ellen Barnard realized she needed to make a change or stress would get the best of her. She'd been co-owner and executive producer of the Atlanta-based production company, Tomorrow Pictures, for 12 years and hadn't made much time for exercise or social commitments. "I wasn't just tired. I wasn't just experiencing malaise. I was really stressed out," Barnard says. "I had an ah-ha moment where I thought, 'If I can get rid of some of this stress, I can be more productive." So, she signed up for a knitting class. To this day, she meets with the group every Monday night. "It was sort of life changing for me," she says. Relax. We aren't telling you to take up knitting. Calming as its proponents say it is, knitting itself isn't what made the difference in Barnard's stress levels. It was the simple act of spending time with people in a social setting. Now, Barnard also meets weekly with a group of women entrepreneurs and walks with her neighbors three times a week. Barnard's story clearly shows that creating time for friends and family can make you feel less stressed--and perhaps even live longer. A 2010 Brigham Young University study found that a lack of social relationships is comparable to smoking in its negative health effects. But in the presence of other people, the brain produces oxytocin, a hormone that can help lower blood pressure, says Kathleen Hall, founder and CEO of The Stress Institute, an Atlanta-based organization that trains companies in stress resilience. Social relationships can even make the challenges you run up against seem more manageable. A 2012 study in the Journal of Experimental Social Psychology found that people who were alone estimated the steepness of a hill as sharper than people who were with friends. "Social connection will actually change your perceptions of the world around you," says Heidi Hanna, author of The Sharp Solution: A Brain-Based Approach for Optimal Performance (Wiley, 2013) and a fellow at the American Institute of Stress, a Fort Worth, Texas-based clearinghouse of stress-related information. "It's such a core survival need to be part of a tribe or a core community." Being in a natural setting also may help prevent stress. That's why eco-therapy, based on the premise that connecting with sounds and images in nature triggers a calming part of the brain, has been gaining popularity, Hall says. A 2007 study at the University of Essex in England found that people who walked outside in a natural setting experienced more relaxing feelings than those who walked indoors. But if you can't escape the office for a stroll in the park, Hall recommends downloading a nature app to your mobile phone and spending a minimum of two minutes each day listening to anything from the sound of water to birds to rustling trees. If nature sounds aren't your thing, consider listening to calming music, looking at images of natural settings or lighting scented candles, Hanna says. "If you can't get to nature, bring nature to you." Your mother was right when she told you to eat your breakfast. "The first thing the brain needs in the morning is amino acids," Hall says. Going too long without eating triggers a stress response that involves foggy thinking, slower digestion and other negative effects, Hanna says. What to eat to avoid this? A good start would be foods loaded with vitamin B6, which helps produce more of the calming hormone serotonin. These include tuna, turkey and bananas. Hall also recommends blueberries, which contain antioxidants and vitamin C. While coffee is fine in moderation, don't overdo it and send your blood pressure rising. Take a few minutes to reset. Preventing stress doesn't have to mean reconfiguring your daily schedule. Hanna recommends taking as little as three minutes between tasks to give your mind a break. "Those short little breaks give the system a chance to reset and decrease stress hormones in the brain," she says. 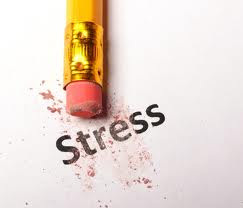 When you're stressed, your body produces too much cortisol, interfering with your mental focus and productivity. It's also important to take a few minutes for a mental break before eating, which helps decrease the stress hormones that hinder digestion. This could be as simple as taking a few deep breaths or visiting with a friend in the office. Exercise is critical in preventing stress. If you can't get to the gym for a full workout, take a break to do two minutes of stretches or to walk a few laps around your office building. This will produce endorphins, which help you manage stress, Hall says. Taking that break before meals is important. It not only helps your body process food, but it also can prevent you from gaining stress-related weight around your belly. Jane Porter is a freelance journalist based in New York. Her stories have appeared in The Chronicle of Higher Education, BusinessWeek Magazine and The Wall Street Journal. She has a bachelor's degree in English from Brown University.